as well as the production of statistics and targeted advertising campaigns. By refusing cookies, you may encounter malfunctions to use our shop. High quality screw whip antenna AZ507R with PL259 for car, from Diamond Antennas & Slim Gainer and amateur radio bands 144/430MHz (2m/70cm). 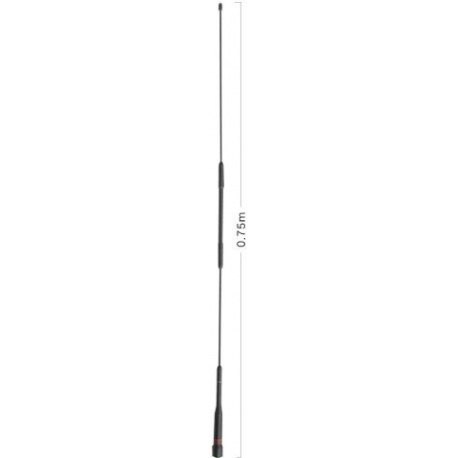 This antenna measures 75cm and exists in 2 versions of finishing: Soft whip (AZ507R) or rigid whip (AZ507FXH). Whatever the version, performances and specs remain the same: Gain of 2.15dBi in 144MHz (1/2 wave) and 4.9dBi on 430MHz (2x 5/8 wave). Supplied without cable and support available as an option. This antenna does not requires a ground plane to operate. Description: High quality screw whip antenna AZ507R with PL259 for car, from Diamond Antennas & Slim Gainer and amateur radio bands 144/430MHz (2m/70cm). This antenna measures 75cm and exists in 2 versions of finishing: Soft whip (AZ507R) or rigid whip (AZ507FXH). Whatever the version, performances and specs remain the same: Gain of 2.15dBi in 144MHz (1/2 wave) and 4.9dBi on 430MHz (2x 5/8 wave). Supplied without cable and support available as an option. This antenna does not requires a ground plane to operate. Payment accepted: By Credit Card, VISA, MasterCard, Paypal and bank wire (T/T). Delivery ECO with Colissimo (5-7 days) or EXPRESS with DHL, TNT, UPS, Fedex (48h/72h). More about our delivery terms. Package prepared in 1-2 business days in ECO, and same day in EXPRESS by Fedex/UPS/DHL for orders before 10am CEST. Return product 14 days & 2 years warranty. For company inside or outside EU, VAT don't apply, for indivudual in EU, VAT 20% apply. For individual outside EU, VAT will not be applied. 117 rue de Charenton 75012 Paris - France. Not open to public.